If we’re not straightening it, we’re curling it. If we’re not dye-ing it, we’re stripping it. Our hair goes through more daily turmoil than the cast of Eastenders and I’m always on the lookout for ways to protect my locks, because heaven forbid, I should actually just stop mistreating them! 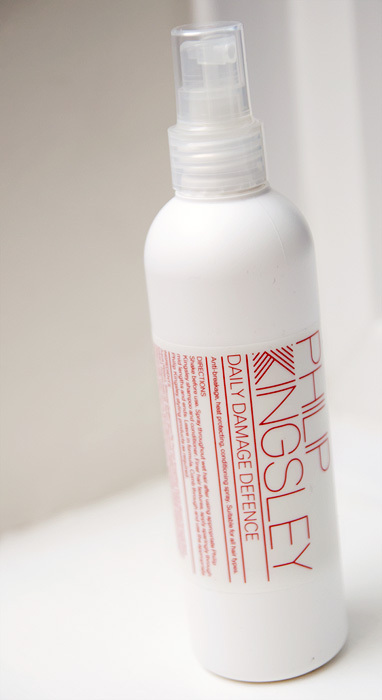 Philip Kingsley, major hair guru (or trichologist to give him his proper name), offers an anti-breakage, heat protecting conditioning spray for all hair types in the form of his Daily Damage Defence* spray. It’s spendy at £22.50 for 250ml but if you only straighten your hair a couple of times a week (like me), this hefty bottle is going to last you 6 months or more with no trouble. If you straighten your hair daily, stop that at once! Many of us straighten our hair to eliminate the frizzies, at least… that’s what I do. I’m a little bit addicted to the glossiness that ironed hair imparts and I haven’t yet discovered the secrets to achieving the same with a decent blow-dry. I’m only washing my hair a maximum of twice or three times a week at the moment because I lose too much colour, too quickly if I wash more frequently and I’m finding that this by itself is helping my hair retain more moisture than normal. I wash (still keep cheating on my SLS-free shampo), condition (deep condition once a week), pat dry with a towel, spray with the Philip Kingsley Daily Damage Defence, and comb through with a boar-bristled brush. Then I blow dry, and finally… run my straighteners through at as low a temperature as I can (anything above 180 degrees is really too hot for hair to handle). 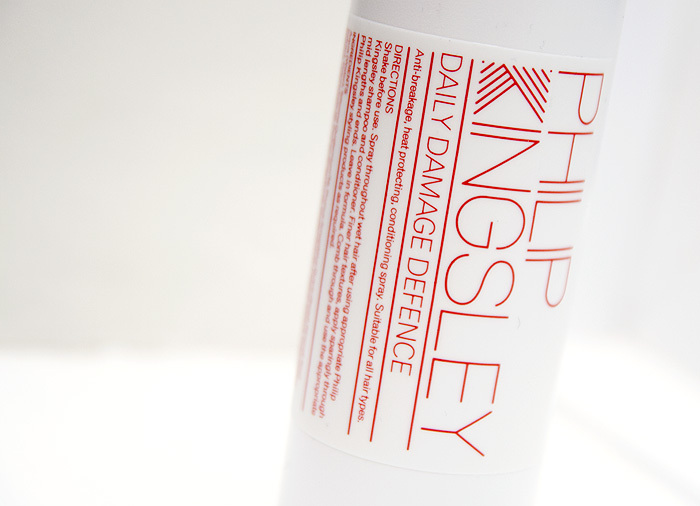 The Philip Kingsley Daily Damage Defence is a silicone-based heat protectant (silicone avoiders beware) with added nourishing benefits from ingredients such as: hydrolised elastin, almond seedcake extract, amino acids and other hygroscopic (moisture-attracting) properties. It smells good and dispenses a fine mist so I don’t overload my fine hair and weigh it down. It’s the only styling product I’ve been using except for hairspray in an attempt to grasp any other benefits that it may be delivering. Has my hair been breaking less? Not really… at least, not that I’d directly attribute to the use of this product. My hair breaks more so (in my opinion) because of my polycystic ovarian syndrome, I’m also a terrible shedder and I can’t have a shower without emptying the plughole of enough hair to stuff a pillow. I haven’t noticed any improvements in this regard since using the Philip Kingsley Daily Damage Defence. Do I see any benefits at all? I find that it’s helping my straighteners glide through my hair more efficiently and more quickly, something which I believe is lessening the scope for damage whilst still delivering good results when I’m done. I haven’t noticed it causing any additional colour leech, infact… I’d say that I’ve had less since I’ve been using it (and it does say “suitable for use on color treated hair”), something which has become a bit of a priority recently. I’ve just been for the chop (4 inches off) so I can’t comment on split ends but I hadn’t noticed a significant improvement and really don’t believe that any product will deliver on that score! It’s more than I’d want to pay for a heat-protectant… but you get a lot of product for your money and it’s packaged in such a way that there is no waste during use, so if you don’t already have something that you’re happy with and can stomach the initial splurge, I do recommend the Philip Kingsley Daily Damage Defence. If you already use something that you swear by at a more bargainous price, I’m all ears! I’ve tried a few and hadn’t (until now) found a happy balance between the product weighing down my hair and not actually achieving anything other than a bit of additional scent! Thumbs up for this one. I have hundreds of the buggers. I find that some heat protection sprays coat my hair so much that it becomes wet so that the straighteners appear to just fry it! The sizzle noise and accompanying steam is not ideal. Have you considered a Brazillian Blowdry? It’s the only thing that has helped my hair. I have, but I’m worried it might make my hair look super-flat. I’ve noticed that prices of those things have come down a lot too, so I am tempted! My hair is so so flat, and I hate it!! Yours is thicker than mine though, so reckon you’ll be fine. I find that for the first couple of weeks after treatment my hair can be very flat, however it’s worth it, and it will regain it’s non-flatness! I’ve tried various treatments now and have been Brazillianing for 2 years. My hair has never been in such good condition and it’s the longest it’s been for 8 years. The only issue with it is the smell! The best ones are the ones you can wash out after 24/48 hours. The original ones I had to wait 72 hours and by this point my hair looked like I’d dipped it in a chip pan. I confess I sprayed the roots with a bit of batiste so I could leave the house. I say go for it! You have the ability to tie your hair up now too, so if it’s flat for a week, who cares You could always put some curls in if you were going out until it does regain its bounce. I might give this a shot. I’ve just reviewed John Frieda 3 day straight at http://mylifeinthings.blogspot.com and found it seriously lacking. Frizz is the bane of my life. I’m thinking about Japanese straightening but it’s so expensive. I’m not prepared to risk the Brazilian approach – it appears that even the formaldehyde free ones use a formaldehyde derivative and are still carcinogenic and quite apart from wanting to avoid cancer myself I’m not prepared to take the moral responsibility for having a hairdresser use something carcinogenic while treating me. I’ve been tempted by the Brocato one: http://www.brocato.co.uk/id74.html – I don’t know if that one uses the formaldehyde derivative though. It’s not a heat protectant, it’s a daily leave in conditioner which therefore helps to protect against heat damage. I don’t think I’m misdescribing it tbh.